The topic of amnesty and “a path to citizenship” for those illegally present in the US has been making the news lately. Illegal immigration is a complicated issue; perhaps we can unravel it a bit. Illegal immigration occurs for a variety of reasons (economic opportunity, drug smuggling, social benefits, joining family, human trafficking, etc.) but only one principle applies: Incentive. People come here (or are brought here) illegally because they (or their abductors) perceive a benefit that outweighs the risk. There are about 11-12 million people present in the US illegally. Illegal immigration is not a felony, such as robbing a bank. It is a civil offense that comes in several forms: illegal entry and overstaying a visa are two. These violations carry relatively minor penalties. Nonetheless, illegal immigration is a violation of federal law. PC police would have us believe the terms “illegal immigrant” and “illegal alien” are racist. The reasoning goes that the terms should be treated as slurs because most (about 70-75%) of those to whom they apply are Hispanic and hale from Mexico and Central America, or because no person is illegal, only acts are. “Undocumented” is the preferred substitute. No doubt, there are racists who use one or other of the terms as code for those of Hispanic descent. That does not mean everyone who uses the terms is making a slur. If I drive faster than the speed limit, I am a speeder. If I steal candy from a convenience store, I am a shoplifter. People who commit such minor offenses and misdemeanors earn themselves appropriate sobriquets, which do not brand them for life. Likewise, people who are illegally present in the US, especially those who remain so of their own free will, have earned a descriptive moniker; “illegal immigrant” is factual, fit for polite company, just like “speeder” or “shoplifter,” and it can be overcome. It certainly has a more benign connotation than many other terms one can think of. Amnesty has been granted at least once before: By Ronald Reagan. Whatever their opinion or stance on amnesty, Republican politicians are generally not in favor of providing a path to citizenship, because, as has been mentioned, the vast majority of those who would benefit from such a path are Hispanic, and Hispanics, as a demographic, tend to vote for Democrats. By the same token, whatever their stated rationale may be for supporting a path to citizenship, Democratic politicians are aware of the huge voting bloc that would accrue to them if “path to citizenship” legislation came to pass. 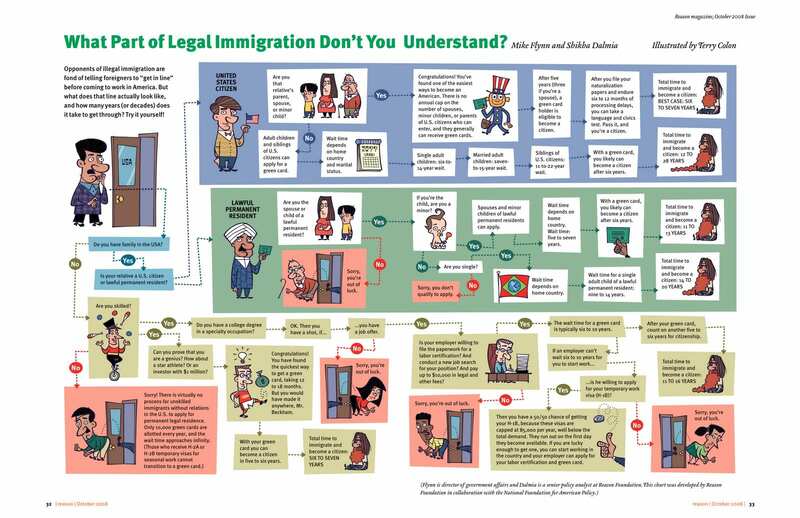 Legal immigration is a nightmare unless you are related to a citizen, rich, or eminent. We need to bring back the “Ellis Island” style of immigration: One shows up at the port of entry, gets documented, enters legally, and works towards citizenship. No quotas. We need to eliminate the incentives for immigration that stem from dysfunctional governance, such as minimum wage laws that incentivize paying paltry wages under the table to migrant workers, draconian drug laws that ensure the street prices attract the most ruthless minds to the narcotics trade, and “in-state” tuition rates at colleges and universities. Any “amnesty” or “path to citizenship” for those already here illegally must include paying the routine fine for the applicable original offense(s). Amnesty should only be from deportation, not from being cited and fined for the original immigration offense. Exemptions should be given for those who were brought here as minors or demonstrably against their will. Any “path to citizenship” should not be rewarded to those already here illegally simply because they are here illegally. It should include being placed last on current applicant lists – in other words, people who have followed the law and are waiting to gain entry, legal residency, and/or citizenship should be ahead of “path” applicants for citizenship consideration. Public or military service for qualified candidates could serve as an alternative mechanism, provided the same opportunity is given to standard applicants. We need to secure our borders.